by Meggyesi Gyula · Published 2018. 11. 05.
by Meggyesi Gyula · Published 2018. 10. 30. · Last modified 2018. 11. 02.
by Meggyesi Gyula · Published 2018. 10. 30.
by Fejér Andrea · Published 2018. 07. 24.
by Fejér Andrea · Published 2018. 03. 13.
by Meggyesi Gyula · Published 2017. 06. 13. · Last modified 2017. 10. 18.
by Fejér Andrea · Published 2017. 04. 26. · Last modified 2017. 10. 18.
by Fejér Andrea · Published 2017. 03. 23. · Last modified 2017. 10. 18. 15 ezer magyar munkahely szűnhet meg! by Fejér Andrea · Published 2017. 03. 17. · Last modified 2017. 10. 18.
by Fejér Andrea · Published 2017. 02. 22. · Last modified 2017. 10. 18.
by Meggyesi Gyula · Published 2017. 02. 12. · Last modified 2017. 10. 18.
by Meggyesi Gyula · Published 2016. 12. 13. · Last modified 2017. 10. 18.
by Fejér Andrea · Published 2016. 10. 12. · Last modified 2017. 10. 18.
by Meggyesi Gyula · Published 2016. 10. 12. · Last modified 2017. 10. 18. 43. 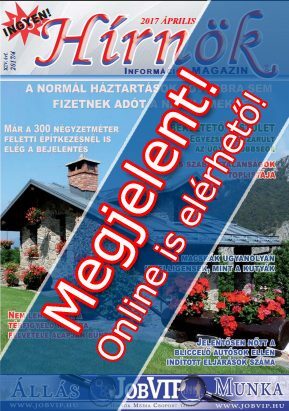 Műegyetemi Állásbörze – október 12–13. by Fejér Andrea · Published 2016. 10. 10. · Last modified 2017. 10. 18.
by Fejér Andrea · Published 2016. 10. 07. · Last modified 2017. 10. 18.
by Fejér Andrea · Published 2016. 10. 05. · Last modified 2016. 10. 07.
by Fejér Andrea · Published 2016. 09. 30.
by Meggyesi Gyula · Published 2016. 09. 28. · Last modified 2016. 10. 04.
by Meggyesi Gyula · Published 2016. 09. 27.
by Fejér Andrea · Published 2016. 09. 06.